Back in the ’60s, a bunch of wasted slackers from an Ivy League school transformed American comedy. For better and worse, three Harvard graduates — Doug Kenney, Henry Beard, and Michael O’Donoghue — transformed the school’s hoary humor magazine into the National Lampoon, a scurrilous, scatological, and subversive publication that combined the inanity of Mad Magazine with the genius of Lenny Bruce and Jonathan Swift. 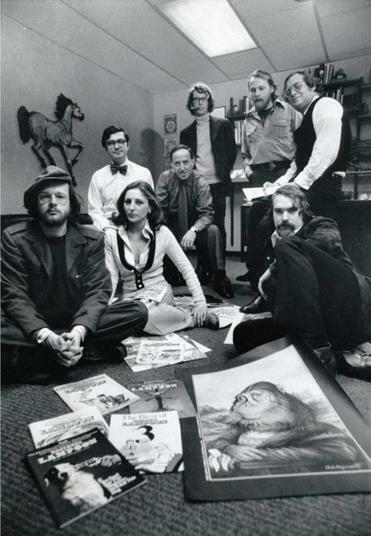 The magazine then metastasized into a brain trust spinning out such ribald Hollywood comedies as “Animal House” (1978) and “National Lampoon’s Vacation (1983),” spread into TV with “Saturday Night Live,” and ultimately inspired a whole generation of wise guys pushing the envelope of transgression and bad taste. In short, anything you laughed at recently probably can be traced back to that primal trio of Lampooners whose story is told in Douglas Tirola’s rollicking documentary “Drunk Stoned Brilliant Dead: The Story of the National Lampoon” (2015). Were they puerile and misogynistic as well as hilarious? Tirola tends not to delve deeply into those issues, nor does he dwell much on the negative side of the four adjectives of the title: The road of excess might lead to the palace of wisdom, but for some of these guys it took a detour to an early death. Instead, Tirola taps into the creative fervor, stylistically re-creating the slash-and-burn brilliance of the magazine’s graphic style and offering commentary from survivors and admirers such as Chevy Chase, Christopher Guest, and Judd Apatow. “Drunk Stoned Brilliant Dead” screens as part of Emerson’s Bright Lights series on Tuesday at 7 p.m. in the Paramount Center. A discussion with Emerson Visual and Media Arts professor Manny Basanese follows. For more information go to web.emerson.edu/brightlights/event/drunk-stoned-brilliant-dead. A publication like the National Lampoon probably would not be possible these days when all that was taboo back then is routinely violated — not just in the media but on the presidential campaign trail. As seen in Mitch Dickman’s documentary “Rolling Papers,” even a staid mainstream publication like the Denver Post can boast of a “marijuana editor” — Ricardo Baca — who’s been on the job since Colorado made the drug legal in 2014. Dickman follows Baca as he patrols the cannabis beat investigating such issues as parental responsibilities, the edible infusion question, and the complications resulting from a state legalizing a drug still criminalized by the Federal government. “Rolling Papers” will be available on VOD on Feb. 19. More timely than ever, the documentary “The Black Panthers: Vanguard of the Revolution” from filmmaker Stanley Nelson (“Freedom Riders,” “Freedom Summer”) outlines the history of the ’60s militant civil rights movement founded by those who decided that passive resistance was not enough to change history, and who dared to claim power and self-protection as the right and duty of African-Americans. Using rare archival footage and interviews with party members, police, informants, journalists, and others, “The Black Panthers” traces the history of the party from its origins to its bloody, tragic end, and examines the legacy it leaves for those who continue the struggle today. It airs Tuesday at 9 p.m. on PBS as part of the “Independent Lens” series. For more information go to www.pbs.org/independentlens/films/the-black-panthers-vanguard-of-the-revolution. Many locations around the world – the Golden Gate Bridge, the Aokigahara Forest in Japan – have become magnet sites for suicides. Among the most popular is the four-mile-long Yangtze River Bridge in Nanjing, China, which has been the site of many of the country’s 200,000 annual suicides. Authorities took preventative measures, but nothing changed until one man decided to dedicate his life to saving these victims of despair. Jordan Horowitz and Frank Ferendo’s documentary “Angel of Nanjing” tells the story of Chen Si, a regular guy who one day in 2003 took a sign to the bridge reading: “Nothing is impossible. When God closes a door he opens a window.” That day, he saved his first life. Since then, like the hero of some Frank Capra movie, he has talked more than 300 people out of ending it all. As the film demonstrates, however, being a saint takes its toll. Chen takes responsibility for the lives he couldn’t save, and the guilt has driven him to drinking and smoking and into family conflicts. Will he become as despondent as those he strives to help? “Angel of Nanjing” can be seen on VOD starting on Monday. For more information go to www.angelofnanjing.com. Meghan O’Hara got a best documentary Oscar nomination as producer of “Sicko” (2007), Michael Moore’s critique of the American health care system. Little did she know that she would be experiencing that system firsthand when she was diagnosed with breast cancer. During her darkest moments, O’Hara came upon Dr. David Servan-Schreiber, a cancer survivor himself, who had become dedicated to finding a way to prevent the disease. With her cancer now in remission, O’Hara decided to make the documentary “The ‘C’ Word,” about the doctor and his system. On first look, the Servan-Schreiber program doesn’t sound like rocket science: eat well, exercise, avoid stress, eliminate toxins. But people in the film testify that it works, and they say that the reason no one has followed up on this “trite but revolutionary” (Servan-Schreiber’s words) regimen is that it doesn’t involve expensive drugs or machinery that will earn more money for the multibillion-dollar anti-cancer industry. Nor are his rules easy to follow in a culture that pushes excess consumption, allows toxic ingredients in products, and engenders stress. But what makes it all seem plausible is the example of Servan-Schreiber himself: 20 years cancer-free, with the drive and charisma to pursue his dream of a world where the disease is preventable. “The ‘C’ Word” screens in the newportFILM documentary series on Tuesday at 6:30 p.m. in the Castro Theatre. The director will be available for a post-screening discussion. Admission is free. For more information go to www.newportfilm.com/film-events/films/c-word.